In the promotion video of EarnHoney, they say you can earn 3 x as much on their site compared to other get-paid-to (GPT) and survey sites. But is EarnHoney legit or just a scam? I decided to put it to the test and joined to see what it really offers. In this EarnHoney review I will show you exactly what you get, so you can easily see if it is worth it or not. The site can be a bit confusing so the review will also work as a tutorial/guide that explains how to use the site if you decide to join. What is EarnHoney and what does the site offer? On the website of EarnHoney, you cannot find much background information about who is behind this GPT and survey site. From what I have been able to find out, it was founded in 2015 so it is still fairly new compared to the big players in this area. 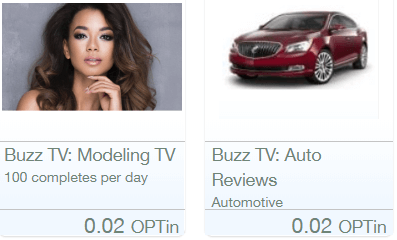 The only info the site itself shows on the site in the about section is a chart that compares EarnHoney with other sites. Looks pretty good based on the chart, right? Let me, however, just reveal right away that I do NOT think this chart represents the opportunities on the site transparently. If you just look at the chart, it looks like it is one of the best GPT sites out there. This is NOT the case, in my opinion. That does not mean it cannot be worth it but just that I definitely do not think it is one of the best. But let’s go over the earning methods you can find on EarnHoney and how to use each of them, so you can see and judge for yourself. 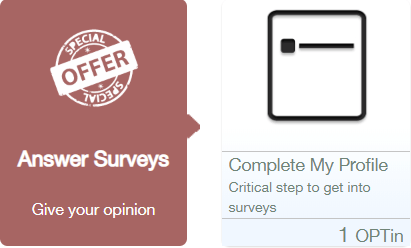 According to EarnHoney itself and the overview chart above, you can take surveys and earn by sharing your opinion. Usually, this is an earning method I like using on GPT sites. However, I ran into some big issues with it on EarnHoney. To be able to qualify for surveys and earn this way, you have to fill out your profile. This is often the case on survey sites and is usually very easy to do. You have to fill out your profile to get access to the surveys. On EarnHoney I tried but after I had filled it out and tried to save, I just got an error. This was just the first of many poor user-experiences I had on EarnHoney. There will, of course, always be some things that can be improved and I am usually quite patient with things like this and would contact support to let them know. In this case, I, however, decided not to do this after having tested the rest of the option on EarnHoney, as I could see it overall was not a site for me. But let’s not get ahead of ourselves but continue to go over the other earning methods to see if that is something you will be interested in. From the info I found from other people that have joined, it seems like some people had more luck than me and got access to surveys through the survey provider PeanutLab. So it seems it for some is possible to find surveys on EarnHoney. But you can also find the PeanutLab surveys on many other survey sites, so it does not offer anything special in this area even if you manage to get access to them. The biggest section on EarnHoney is where you can earn by watching videos. You can choose to watch videos in different categories, so you should be able to find some interesting videos no matter what you are interested in. There are many videos on EarnHoney – they are just not easy to get access to. However, again here it is one of the worst user experiences I have seen on a GPT site. Many sites offer you to watch videos to earn, but usually, it is very simple to just click a button and then start watching. On EarnHoney there are several steps. First, you click the category you would like to watch a video in. Then you get to a page that describes the rules. To move forward you then have to click a link to go to a Facebook page of the partner that has this video. On this Facebook page, you then have to click a link to go to another website and watch the actual video. A little overly complicated, right? In addition to this, it is difficult to see if it is working properly and if the view is being registered. According to the description on EarnHoney, you can see what is called viewability circles. If these viewability circles turn red or green, everything is working. It is not exactly clear where you will see these circles, and I did not manage to see them anywhere even though I tried several times. Even if you get these viewability circles to work, it is an overly complicated system to earn by watching videos, in my opinion. Especially when you look at the rewards for it. As you can see in the image above, you usually get around 0.02 OPTin for watching a video. 1 OPTin is worth $0.10. So this means you have to watch 50 videos to earn 10 cents. Not really worth the hassle, is it? 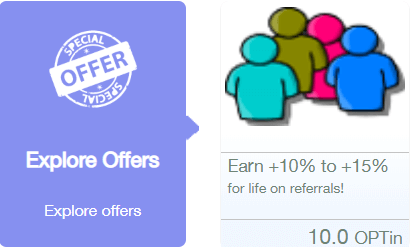 Usually paid offers can be a great way to boost your earnings on GPT sites if you choose the right offers. There is really not much to say about this option on EarnHoney. It might because of the country I live in, but the only “offer” I got was to invite friends to join. The only “offer” I got. Usually, an offer section on GPT or survey sites will have a lot of free trials, apps you can download, contests, and more. I was not able to find anything like this on EarnHoney. According to the overview I showed at the beginning of this review, EarnHoney offers you to play games to earn. They actually do not as such have a section that is called games, but if you click “play games” in the side menu, you get to a section with apps. The games section does also not offer much. Like with all the other earning methods, I was NOT impressed with what it offers in this section. It basically offers you to download 3 apps for very low rewards (that was what I was offered anyways). Maybe you cannot see it in the image above, but for two of the apps, it says an amount you can earn per day. Be aware that this is not directly in your EarnHoney account you will earn this. The apps seem to be a part of the same network as EarnHoney and in that sense, you will earn OPTins. But again not something that will earn you a lot of money. At the top of EarnHoney’s member area when you are logged in, you can see an option to get free OPTins by finding what is called EarnHoney codes. It will take patience to find the EarnHoney codes. These are free promo codes and this is often used by survey and GPT sites. 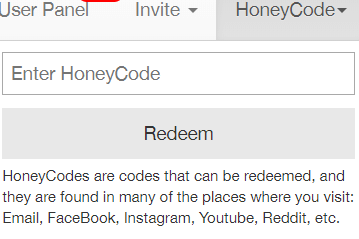 According to EarnHoney, you can find these promo codes on their social media accounts. I have had a look through their social media accounts, and I have not been able to see any codes posted for a long time. So it seems like you have to be very patient to find any of these codes. As mentioned, many sites use promo codes like this. One of my favorite sites PrizeRebel for example also uses this, but here you can usually find around two codes per week. So also in this area, EarnHoney’s earning methods are just not as good as on many other sites, in my opinion. When you first join, you will also see a field asking if you have an EarnHoney registration code. This is not a promo code that will give you free points. What this is, is a code from a friend that invites you. It will not give you extra rewards, so if you do not have one, you do not have to worry. If you want to give EarnHoney a try, it is very important to also know what kind of payout methods it offers. You do not want to spend time earning only to find out it does not offer payout methods you like. But the payout methods are, in my opinion, actually one of the best things about EarnHoney. You can get paid through PayPal, get Amazon gift cards, prepaid Visa debit cards, donate to charities, or get paid in OPTins which is a form of cryptocurrency. The payout methods on EarnHoney. The payout threshold is only $5, so it is a fairly low threshold. But with so many great PayPal sites that also have low payout thresholds, it is still not something that impresses me. According to the overview chart from the beginning of the article, EarnHoney pays out within 2-3 business days. That is ok. But what I do not like is, that they on the chart make it look like other sites take 2-3 weeks to payout. Yes, some sites might take this long, but it is very few. Many sites, in fact, pay out a lot faster. A site like Superpay.me, for example, pays out within a few hours after you have requested a payout. So it is simply not true that EarnHoney pays out faster than other sites. Maybe faster than some, but there are MANY that pay out even faster. The big question to find out if EarnHoney will be worth it is how much money you can end up making on this site. If you just look at the claims of the site itself, it looks like you have really good earning opportunities. In the presentation video on the website, before you log in, you are for example told that you can earn 3 x more than on other reward sites. EarnHoney claims you earn 3 x more on their site – I would love to see the calculations for this. I honestly do not know where they get this number from, but I would love to see these calculations. They do not at all fit with my experience. I have tested hundreds of survey and GPT sites and the top paying sites will in my experience not only give better rewards. They will also give more earning opportunities and are easier to use. Another thing I do not understand is that in the chart that they use to compare EarnHoney with other sites, it says there is a first day gift card guarantee. It does really not make sense that they say there is such a guarantee. I have not been able to find any information about this guarantee other places on the site. In the FAQ section, there should be some terms and conditions about this guarantee but there is not. So even though EarnHoney might make it look like it has really good opportunities to earn easy money online, it really does not offer much, in my opinion. And if you join, you should not expect to earn too much. 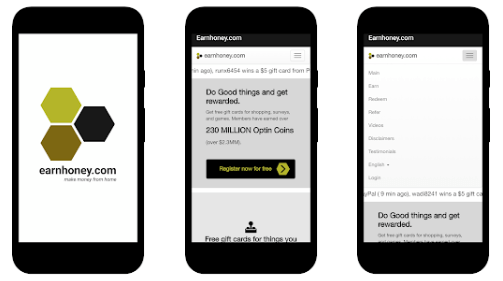 If you end up joining EarnHoney and like to use it, you might be interested in using it on the go. This is possible with the EarnHoney app. You can use the EarnHoney app to get easy access to the platform. The app does not really offer anything special or anything in addition to the website itself. But if you like using the site, the app can be a way to get easy access. When you look in the FAQ section of EarnHoney, it says you can only join from the USA. But you can actually join from any country, as you in your account settings can choose more or less any country. So if you want to join EarnHoney, you can do it no matter where you live. When you are logged in, you will however at the top of the screen see a bar saying that international users will have fewer opportunities than US residents. However, no matter what country you live in, there will in, my opinion, be better sites in your country. The EarnHoney support section is not easy to find but it is there if you should need help at some point. At the bottom of the screen in the footer, there is a small link called “support site”. If you click this, you will get to a page with a lot of questions and answers. In the top bar of this page, you can see a small link called “submit a request”. If you click this, you will be able to send a message to support. It does not say how quickly they will get back to you, and I have not been in contact with their support myself (as I have decided not to use the site anymore). So not sure how quickly you can expect an answer but now at least you know the support option is there and where to find it. From this review, I think it is pretty clear that I am not impressed with what EarnHoney has to offer compared to other GPT and survey sites. This does, however, not mean it is a scam. It offers legit ways to earn and legit payout methods, so it can be an option depending on your preferences. But let’s finish by summing up the pros and cons of EarnHoney to give you a better overview before deciding if it is for you or not. Yes, it is possible to earn some extra money on EarnHoney and it has a low payout threshold. In my opinion, that does however not make it worth it. The usability is one of the worst I have tried for a reward site. When you put this together with the low rewards and the limited earning opportunities, it is just not worth the time, in my opinion. 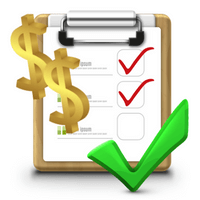 There are so many great GPT and survey sites, so no need to waste time on sites that do not offer enough. I would therefore instead suggest you to check out the list of the best sites in your country. All of these sites are easier to use, have better rewards, and have more opportunities. If you have any comments, questions, or have any experiences with EarnHoney yourself, I would love to hear from you in a comment below. EarnHoney is legit and you can earn some extra money on the platform. The usability and the opportunities are, however, very poor compared to other similar sites, in my opinion and experience. It is therefore not a site I recommend spending time on, as there are so many other sites where your time is better spent.